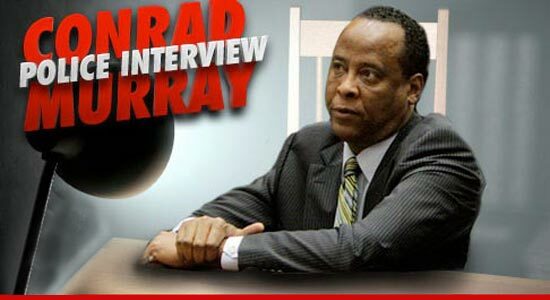 “I have to sleep, Dr. Conrad, I have these rehearsals to perform.” That’s what Dr. Conrad Murray told investigators Michael Jackson said to him in the early morning hours of June 25th, 2009. Hours later, Jackson was dead. In what's been the most anticipated evidence in the trial, the prosecution played the jury Dr. Murray's 2-hour interview with LAPD detectives, recorded 2 days after MJ died. Murray told detectives he arrived at Jackson’s rented mansion at 12:50 AM on June 25, and headed straight to Michael’s room to wait for him to come home after rehearsals. According to Murray, Jackson arrived at 1:05 am saying he was tired and fatigued. Murray rubbed a cream on Michael’s body to treat his Vitiligo ... then gave Michael a 10 mg Valium pill. Michael couldn’t sleep, so Murray says he then gave him 2 mg of the anti-anxiety drug, Lorazepam. Jackson complained he still couldn’t fall asleep, so Murray gave him 2 mg of the sedative Midazolam around 2am. MJ remained awake. Dr. Murray said he suggested turning down the music in the room ... and meditation. Murray said Michael “reluctantly" closed his eyes, finally dozing off around 3:15 am, only to reawaken at 4:00 am. At 4:30 am Murray said Michael said, “I have to sleep, Dr. Conrad, I have to sleep." Murray gave MJ another 2 mg of Lorazepam. Again, according to Dr. Murray, Michael couldn’t sleep. Jackson was still wide awake at 7:30 am, so Dr. Murray administered another 2 mg of Midazolam, yet Michael remained awake and complaining that he was going to have to cancel the “This is It” tour. Murray said Michael began to beg for his “milk,” the slang for Propofol. Murray agreed to give him 25 mg of the powerful sedative around 10:50 am, slowly infused over 3 to 4 minutes. Murray said Michael finally fell asleep around 11 am. Dr. Murray said he monitored Michael long enough until he felt comfortable to leave the room, that’s when Murray told the detectives that he went to the bathroom and was gone for about two minutes. Murray said when he came back, he found Michael not breathing with an accelerated pulse. Murray said he began mouth to mouth on Michael, and then chest compressions with one hand. Murray said he couldn’t take Michael off the bed to a harder surface, so he improvised by placing his left hand under the body. Murray said while he was giving compressions, he called MJ’s assistant on his cell. He said didn’t ask the assistant to call 911 because he was busy giving CPR. Murray also told detectives he didn’t call 9-1-1 himself because he didn’t know the zip code for Michael’s house. Dr. Murray said he lifted Michael’s legs in the air to get more blood flowing to his heart. Murray told detectives that he then went downstairs to ask Michael’s chef to get security, who called 9-1-1. Murray continued CPR until the paramedics arrived and hooked Jackson up to a pulse oximeter and got him intubated. Murray told detectives paramedics were talking to UCLA medical center and ready to give up, but he begged them to transfer care to him because Michael was his friend. Murray rode with Michael in the ambulance to UCLA, where Murray said they worked on Michael for about an hour. After Michael was gone, the ER doctor asked Murray what happened, and he told her that maybe it was a massive pulmonary embolism. Murray told detectives he didn’t sign the death certificate because he didn’t understand the cause of death. The next night, that wasn’t the case.